Sushil Kumar is an Indian World Champion wrestler who won the gold medal in the 66 kg freestyle competition at the FILA 2010 World Wrestling Championships, a silver medal in the Men's 66kg Freestyle Wrestling event at the 2012 London Olympics and a bronze medal in the Men's 66kg Freestyle Wrestling event at the 2008 Beijing Olympics, making him the first Indian to win back to back individual Olympic medals. Trained by some of the most legendary wrestlers of India, Sushil endured tough training conditions on his way to becoming a champ. His first success came at the World Cadet Games in 1998 where he won the gold medal in his weight category. He followed this up with a gold in the Asian Junior Wrestling Championship in 2000. 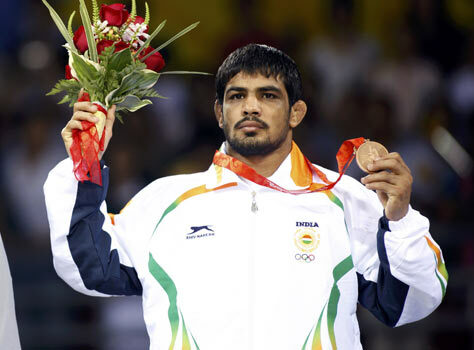 Progressing from the Junior division Sushil Kumar won the bronze medal at the Asian Wrestling Championships in 2003 and followed that up with a gold medal at the Commonwealth Wrestling Championships. He won gold medals at the Commonwealth Wrestling Championships in 2005 and 2007 and a bronze medal in 2008 Olympic Games in Beijing. He also qualified for 2012 Summer Olympics taking place at London and won a silver medal by defeating a wrestler from Kazakhstan. He became the first Indian to win 2 Olympic medals. Sushil Kumar was awarded the Arjuna Award in 2006.